Chipotle may need a successful launch of its queso to make customers forget about the events of last week. The Mexican chain, already in its second year of a slow comeback from a series of food poisoning outbreaks, saw its perception drop to an 11-month low after a norovirus outbreak at a Virginia store and a video circulated of rodents falling from the ceiling of a Dallas store, according to YouGov BrandIndex, the only daily brand consumer perception research service. Those back-to-back incidents caused two more potential headaches for Chipotle as its stock dropped 4.5% on Thursday, July 20th. 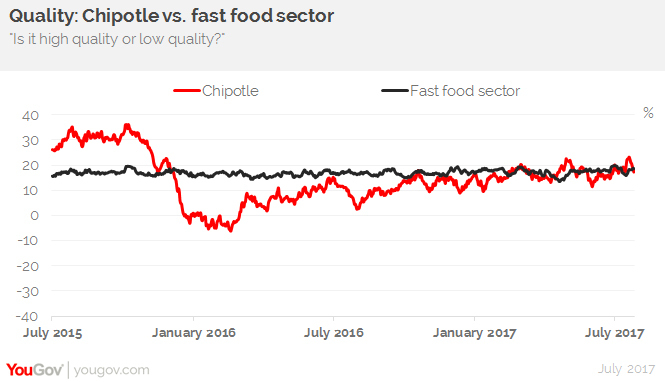 YouGov BrandIndex’s Quality score for Chipotle took a downturn after recently breaking past the average Quality score of the fast food sector, a comeback almost 18 months in the making. 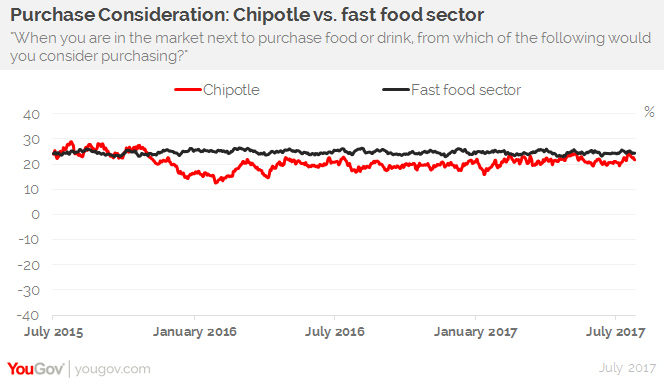 Chipotle’s Purchase Consideration score also declined from 24% of consumers considering buying Chipotle the next time they frequented a fast food restaurant to 22%. On August 1st, Chipotle will roll out testing of queso sales in 350 stores across both California and Colorado, with a plan to take it national in the fall if it is successful. 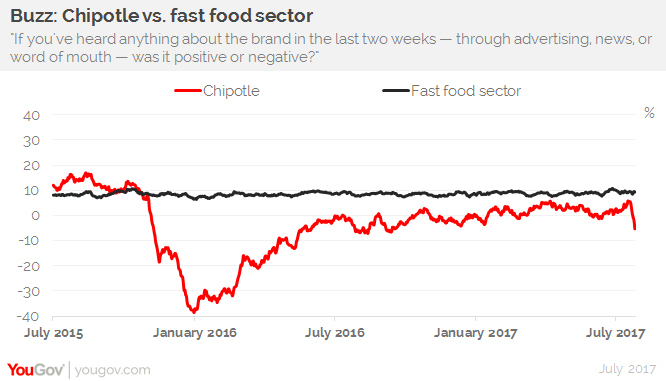 Since the fall of 2015, when a series of e-coli and norovirus breakouts forced stores to close and resulted in an earnings downturn, Chipotle followed a common pattern YouGov BrandIndex sees with brands in major crises: a slow perception score comeback followed by hitting a “wall” that they have trouble moving past. The “wall” is almost always at a level considerably below where the brand was before the crisis broke out. Chipotle arrived at their “wall” in July 2016 where perception improvements slowed noticeably — though they were still gradually increasing until the most recent incident. YouGov BrandIndex measured Chipotle with two scores besides Purchase Consideration: Buzz ("If you've heard anything about the brand in the last two weeks, through advertising, news or word of mouth, was it positive or negative? "), and Quality ("Is it high quality or low quality?"). More than 50,000 regular fast food eaters were interviewed over the time period. Margin of error +/- 3.5%.